1) How do I contact Home Needs Online? You can use our Contact Us page to get in touch, otherwise just call our Service Team on for assistance. (The Contact Centre is open from 9.30am - 6 pm, 5 days a week). 2) When will the money be debited from my card automatically? Your payment will be debited for the full amount only after you confirm and proceed with the payment process. 3) How can I change my credit card details? You can add, remove or edit payment card details by simply going to the "Your Account" section and clicking on "Your payment details". When you're checking out your order, you can change your payment card or add a new one from the "Order Summary". 4) Can I pay with a specific card? 5) My bill is incorrect, how do I get it clarified? If you think your bill is incorrect, please contact our Service Team on 1800 102 6860, or email us at care@homeneedsonline.com. The contact centre is open from 9:30am - 6pm, on all business days). 6) What if I have a problem with "verified by visa" secure code? Please contact your bank or card issuer with any problems you face using this service. You might have to create a new password for the same before using the card online. Home Needs Online does not have access to any of the information you have provided. 7) Verified by Visa and MasterCard Secure Code are online payment protection schemes ? Your card issuing bank may be a part of the Verified by Visa or Mastercard SecureCode scheme. If they are, you may be asked to set up or enter your password so that they can validate online payments. This adds an extra level of security to ensure that only you can use your card safely to pay online. 8) Can I use 2 cards to pay for one order? We're sorry but at the moment you can pay using only one card. 9) Do I have to register an account with Home Needs Online to place an order? Yes, you have to register an account with us to order online. Setting up an account on www.homeneedsonline.com is a simple process and it allows you to make repeat purchases without having to enter details every single time. 10) How do I know if my order has been received? When we receive your order, an Order Acknowledgement screen will be generated, issuing an order reference number. Please print out this page or save it on your system for future reference. You will also receive an email confirming that we have received your order details. 11) Can I add to an existing order? You can add items to your order until you click on "Proceed to Checkout"? which will take you to the payment page. Once the order is confirmed, you can't add items to the same order. If you'd like to order additional items, please place a new order. 12) Can I place an order from overseas? Yes. And you will be charged for locations outside India , our dedicated team will get back to you with the best shipping rate. 13) How can I pay for my purchases? You can pay for your purchases online using most major credit or debit cards, including, American Express, Mastercard, Corporate Link Card/Business Account, Maestro, Mastercard, Visa Credit Card, Visa Debit Card, Visa Electron. Your credit card details will be encrypted to help keep them secure. Please note that in the interest of security, Home Needs Online will never ask for your full username, password or credit card details via emails, pop-ups, or for any purpose other than registering or placing an order on www.homeneedsonline.com. See our Security page for further details on how to make your online shopping secure. 14) Are my details secure? Shopping on www.homeneedsonline.com is secure.. Your credit card details will be encrypted to help keep them secure. Please note that in the interest of security, Home Needs Online will never ask for your full username, password or credit card details via email, pop-ups, or for any purpose other than registering or placing an order on www.homeneedsonline.com. See our Privacy page for further details on how to make your online shopping secure. 15) What should I do if my credit/debit card was refused while placing an order? If your credit or debit card was refused while placing an order on www.homeneedsonline.com , please re-submit your order using a different card. For details on why your card was refused, please contact your card issuer. 16) Where do you deliver? 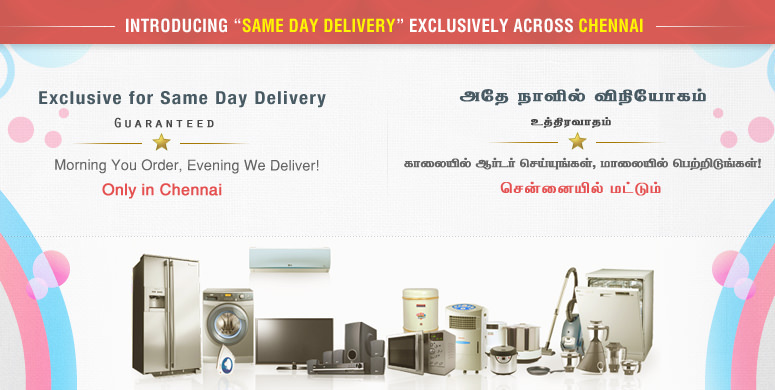 We currently deliver to all major cities, towns and villages across India. 17) Can I specify a delivery date when ordering? Yes, for most items you'll be able to select a preferred delivery date when placing your order. If, for any reason, we can't offer you a choice of delivery dates to pick from when ordering online, in most cases we'll call you to arrange a delivery date as soon as the goods are ready to be dispatched. Depending on your order, someone may need to be present at the time of delivery to sign for the items but you can specify a delivery address different from your home or main contact address, if convenient. Some orders can be left in a safe place. If so, we will let you know during the checkout process and you can provide delivery instructions. 18) When will my order be delivered? An estimated delivery lead time is shown next to each product on this website. This is updated on a daily basis to reflect the latest stock situation. This is the same if you order by telephone as well.. For most items, you will be offered a list of delivery dates and times to choose from when placing your order. If, for any reason, we can't offer you a list of delivery dates to pick from, a representative will contact you to clarify the same. See track order information for further details. Please note that if your order is a mix of items, deliveries may be made separately. 19) Do I have to be there to sign for delivery? Most deliveries require someone to be present to accept and sign for the delivery. This is simply to ensure the goods were delivered and received correctly. If you can not be there to sign for delivery and your order qualifies, you may be able to provide special delivery instructions during the checkout process for our drivers to leave the item(s) with a neighbour or in some other safe place. Otherwise, remember that you can specify a different delivery address while ordering and have your order delivered to your workplace, or a friend's place, etc. See Shipping Info for further details. 20) Can I return a product, exchange it or get a refund? Our objective is to offer you best quality products.If for any reason you are unsatisfied, kindly visit the Terms And Conditions page to learn about the returns/refund/exchange policy. 21) What counts as proof of purchase? If you order online through one of our websites your confirmation email and the label on your parcel are your proofs of purchase. If you placed your order over the phone your order number and the label (or delivery note) on your parcel are your proofs of purchase. 22) Are receipts sent with deliveries? All dispatches will be along with a proper VAT receipt. 23) How do I write a product review? After completing an order or reservation online, you will be invited by email to submit a product review. The email will be sent to you about 2 weeks after receiving your product where you can submit a review and rate your product. In addition we may sometimes ask if it is possible for you to answer any questions on your product from other customers. Once submitted, it usually takes 72 hours for a review, question or answer to appear on the website providing it adheres to our publishing guidelines. 24) How can I view and update my account details? Once you've registered with www.homeneedsonline.com, you can sign in to your account at any time to view and update the personal details you have saved. To make your account easier to access, we have recently made some changes to the account sign in. You now sign in to your account using your email address, rather than your login name. Please visit the Sign in & registration section for further details. 25) I have requested a password reminder for my account and haven't yet received it, what do I do? Please check your email, sometimes our mail could have been redirected to the spam folder. If you have not received a mail from us, kindly retry and represent the request for change of password. We will ensure an email is sent out to you instantly. 26) Can I pay by EMI? After each EMI payment, the principal amount is reduced and interest will be calculated on remaining outstanding amount. Some banks may charge service tax on the interest paid. 27) What is EMI & Is EMI available on all Products? 28) Who can avail the EMI payment facility? The EMI payment option is available for ICICI, CITI, HDFC, SCB, SBI, HSBC, INDUSIND and KOTAK card holders. You can opt for the 3, 6 , 9, 12 and 18 monthly instalments. 29) What is the processing fee to avail the EMI? 30) What if refund happens after EMI paid to Bank? The purchase amount will be refunded by Home Needs Online. In some cases, cancellation charges may apply. Interest on the EMI paid to the bank will not be refunded by Home Needs Online under any circumstances. You may contact your respective bank for the same. 31) Can I Use Debit Card to Opt EMI? During check out, if Debit card details are entered after choosing the Credit Card option then it will be considered a non EMI transaction. 32) How long does it takes for transaction to convert into EMI? An EMI transaction takes 7-10 days to reflect in your statement. If your bank statement is generated during this period, we urge you to co-ordinate with your bank and inform about the transaction to resolve any conversion issues. If your bank denies or does not approve of EMI, this transaction will be considered a non EMI transaction. 33) How can I choose this option? Once the order is placed, the shopper will have to choose the payment method. While choosing the payment method, the EMI option has to be selected which will lead the shopper to the installment option (3, 6, 9, 12 & 18 months) accordingly. 34) How will I know the exact amount of my EMI? 35) Why should I opt for the EMI payment option? An EMI gives you the freedom to purchase a product and make equal monthly payments. You can buy now and make the payment in the next 3 months, 6 months , 9 months, 12 months or 18 months by paying a nominal annual rate of interest to bank. Get smart and opt for the hassle free EMI payment mode and let not the costs stop you from buying your favorite products. 36) What is the Rate of Interest charged by various banks? The Annual Rate of Interest depends on your bank and the chosen EMI plan. The below table shows bank-wise Rate of Interest.